Pufferfish; anthropomorphically-speaking are perhaps the best “pets” in the entire hobby. They are endearing, long-lived and remarkably expressive. 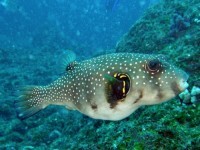 While they do require specialized feeding, puffers are generally hardy and straightforward when it comes to their care. It’s difficult to not fall for these engaging fish—in no time even their messiness will seem cute.